Bring a large pot of salted water to a boil. In a medium saucepan, bring the chicken stock to a boil. Add the peas to the stock and cook over moderately high heat until just tender, about 10 minutes. Transfer the stock and all but a small handful of the peas to a blender and puree until smooth. Cook the farfalle in the boiling water until al dente, about 15 minutes; drain and return to the pot. Meanwhile, heat a medium skillet. Add the bacon and cook over moderately high heat, stirring frequently, until browned and crisp, about 7 minutes. Transfer to a paper towel-lined plate. Pour off all but 1 tablespoon of the bacon fat from the skillet. Add the morels and cook until they release their liquid, about 4 minutes. Raise the heat to high, add the cream and season with salt and pepper. Cook until slightly reduced, about 2 minutes. 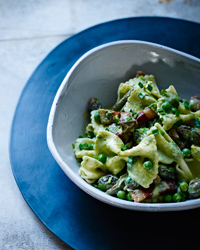 Stir in the pea puree and whole peas and cook until just heated through. Add the morel and pea sauce, the bacon and chives to the pasta in the pot. Toss well, then transfer to plates and serve at once. Smoky bacon, sautéed morels, cream, garlicthe ingredients in this rich pasta dish point directly to a flavorful but balanced red as the ideal match. A Rioja from Spain would fit the requirements perfectly.